The abbreviated week comes to an end, and so does the anti-ICE protest camp in Philly. 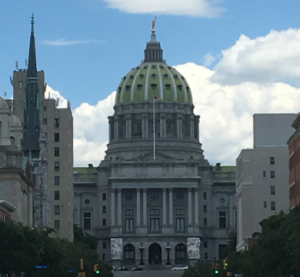 Plus, a look at the state of gun reform bills in Harrisburg. Politically Uncorrected: A Pennsylvania Paradox: America has endured 154 mass shootings so far this year – from Parkland Florida to Annapolis Maryland. Despite this national carnage nothing so far has moved the Pennsylvania state legislature to pass even the most innocuous gun control legislation. Why? Capitolwire: PA Lottery moves away from deficit threat. Capitolwire: Anti-abuse bill signed by Gov. Wolf. Inquirer: Did Philly police just bike-doze Mayor Kenney’s relationship with progressives? WESA: A Year Ago Peduto Challenged Trump On Climate Change. What’s Happened Since? Post-Gazette Editorial: Alcosan’s frontman: A retired judge gets cushy-looking post for what? Lancaster Online Letter: $15 million is insignificant? Jon Geeting: Philly Free Streets is so joyful. What if it happened every single week?